In October 2011, the Foundation released the most comprehensive report ever published on the landscape of macular degeneration in Australia. 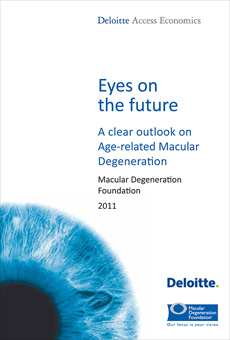 The report was produced in partnership with Deloitte Access Economics and co-written by Professor Paul Mitchell, the Foundation’s National Research Advisor, and a world leader in the epidemiology, diagnosis and management of macular degeneration. Eyes on the Future – A Clear Outlook on Age-related Macular Degeneration details the diagnosis, epidemiology, risk and protective factors, costs, treatment, treatment barriers and low vision rehabilitation of macular degeneration and makes numerous recommendations to improve outcomes for patients. The report has received acclaim from experts in Australia and around the world.